1 of 6 Heat oven to 350 degree F. Coat six 1-cup ramekins with nonstick cooking spray. 2 of 6 In a large bowl, combine pears, peaches, plums, sugar and cornstarch; stir to combine. 3 of 6 Mix granola and butter. 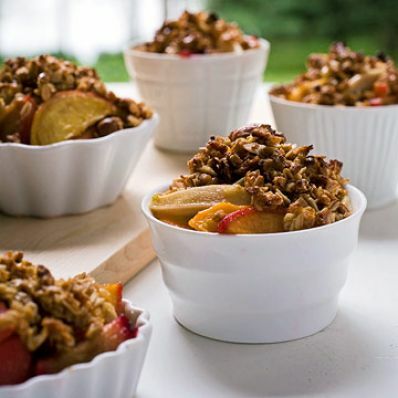 4 of 6 Sprinkle 1 tablespoon of the granola in the bottom of each ramekin, followed by 1/2 cup of the fruit mixture. Sprinkle 1/2 tablespoon granola over the fruit. 5 of 6 Layer on an additional 1/2 cup of fruit and top with 1/2 tablespoon granola. 6 of 6 Bake at 350 degree F for 40 minutes. Remove from oven and cool for at least 15 minutes. Serve warm or at room temperature. Per Serving: 6 g fiber, 278 kcal cal., 10 mg chol., 3 g sat. fat, 54 g carb., 7 g Fat, total, 3 g pro.